Here is the running order with stage times for Kaya Fest 2018! 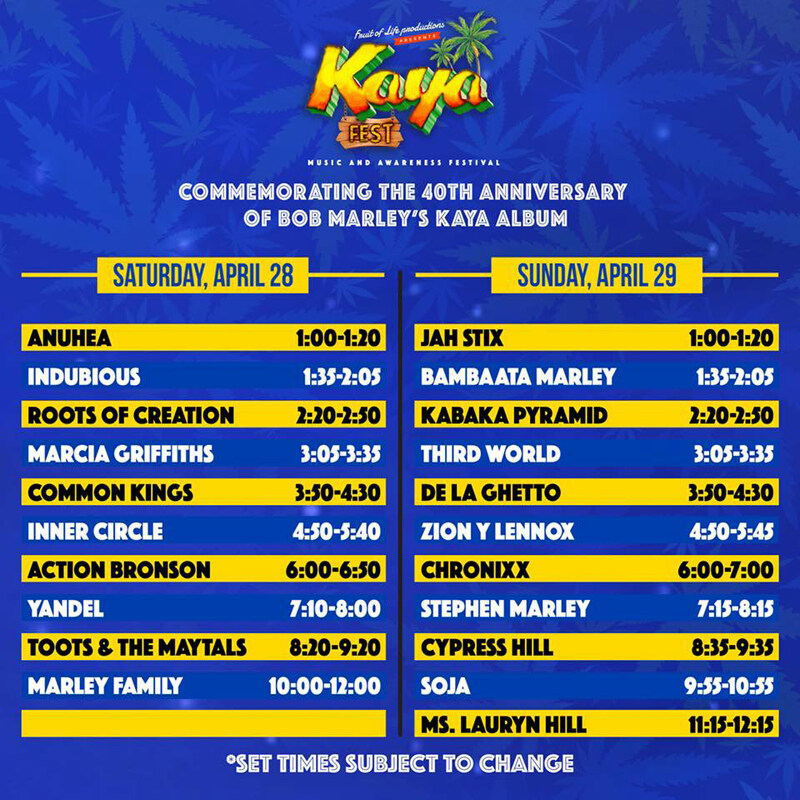 It was also recently announced that Damian Marley, Julian Marley, and Ky-Mani Marley will be joining Stephen Marley for a special acoustic tribute commemorating the 40th anniversary of the Kaya album on Sunday. Don’t miss this historic performance as it’s the first time in history the brothers will be performing this acoustic performance together on stage. Headlining on sunday evening is Ms. Lauryn Hill. That performance marks the first show of her The Miseducation of Lauryn Hill 20th Anniversary Tour 2018! Saturday, April 28th: Stephen Marley, Ziggy Marley, Damian Marley, Julian Marley, Ky-Mani Marley featuring special guest Tom Morello, Yandel, Action Bronson, Common Kings, Toots & the Maytals, Marcia Griffiths, Inner Circle, Kabaka Pyramid, Roots of Creation, Anuhea, Indubious, Skip Marley, Jo Mersa Marley, Yaadcore. Sunday, April 29th: Ms. Lauryn Hill, Cypress Hill, Stephen Marley & Damian, Julian, Ky-Mani, SOJA, Zion y Lennox, Chronixx, De La Ghetto, Third World, Kabaka Pyramid, Yaadcore, Bambaata, Jahstix, Shacia Payne.